Last week before we took off to go to Seattle for our friend’s graduation I decided to make Baghali Polow, rice with fava beans and dill, because I had a sudden craving for it, but also because someone in the comments has asked about it. But then I realized something of grave importance. I have neglected to post about one of the key elements in Persian cooking: how to make Persian rice. For anyone who has ever had Persian food, you know that the method in which the rice is made is very different than what you are used to, ya know, the basic 2 cups of water to one cup of rice, cook for 50 minutes or what not. Well that’s not how Persians roll when it comes to rice making. You read it right, rice making is a PROCESS. Most importantly, you can’t use any type of rice your little heart desires, you must use basmati rice. It has taken me many tries in order to get it right. Not to say that it is awfully difficult, it is not, but you have to be shown how to make it right and know how long to cook the rice for. I have concluded that making Persian rice is an art. So here is the way that I usually make stove top rice. Please make sure you make this type of rice in a non-stick pan. Please note that this recipe is good for two people. I only made this recipe for tutorial purposes. The amount of rice obviously varies depending on how many people you are cooking for. Additionally, measuring rice is different depending on whether a standard measuring cup is used verses the measuring cup that comes with rice cookers (Persian or non). A rice cooker measuring cup is equivalent to 3/4 of a standard measuring cup. I usually use the rice cooker measuring cup when cooking rice, and usually allocate about one cup per person. Measure out your rice and place in a bowl. Note the measuring cup in the above picture came with my Persian rice cooker and it is the one that I always use for measuring rice. Wash rice a few times until the water looks clear. This is a very important step in cooking Persian rice. Essentially, what you are doing is removing the starch from the rice. I know someone (read: The Sous Chef) who always neglects to do this step. It is such an insult to our rice, I tell ya! The first time he told me that he made rice without washing it, I nearly spitted the rice out. Fortunately for him, we had guests, and I had to keep my horror and disappointment under wraps. But dip down inside I wanted to yell and scream profanities. Add some salt and let the rice soak for a few hours. It is generally strongly believed that rice should rest over night for best results. Now, let me tell you, the world will not come to an end if you don’t soak your rice. If it did, then we would not be here, courtesy of yours truly. When you are ready to cook bring 6 cups of water to a boil. I don’t like to take chances so my rule of thumb is 3 cups of water per cup of rice. You will be amazed how the rice soaks up the water. In the mean time in a mortar add sugar and saffron and grind until saffron turns into a powder. Once your water starts boiling, take 2 tbsp of the hot water and add it to the saffron and sugar powder. Then salt the boiling water. Think of this part of the process as cooking pasta. You salt the water, add the pasta, cook until done, and then drain. We do the same thing here: place the rice in the boiling water and cook for about 10 minutes. This is the first crucial moment of rice cooking. Make sure that you stir the rice a couple of times from bottom up during the cooking time. Once the 10 minutes are close taste your rice. It should be soft, not hard or mushy. It should be longer than it was before it went into the pot, but it should not be moments from falling apart. While your rice cooks, place yogurt in a mixing bowl, add saffron water to it and mix well. Please note that it is best to not use yogurt that it is too sour for this recipe. Once your rice is ready drain in a colander and give a quick rinse with cold water to stop additional cooking. Add about 4 to 5 tablespoons of rice to the yogurt mixture. Add a very thin layer of water to the bottom of the pot. Essentially, what you are looking for is a thin layer that covers the whole bottom of the pot. Add oil, I would say for this recipe 1 tbsp, more if you are using a bigger pot. Give it all a shake so that the water and oil get a little mixed up. This my friends, it is the first step in making Tahdig. Cover the bottom of the pan with rice mixed with yogurt. You ask why we add yogurt and saffron? Because it makes really yummy Tahdig! Pile up the rest of the rice on top in the shape of a pyramid. With the back of your spatula make 4-5 holes, making sure that you don’t go through the rice and yogurt mix. This is done for steaming purposes. Cover and cook on high for 10 minutes, NO MORE THAN 10 minutes. After 10 minutes place a towel over the lid of the pot, cover, and cook on medium low for 1 hour. At this point you are steaming your rice. 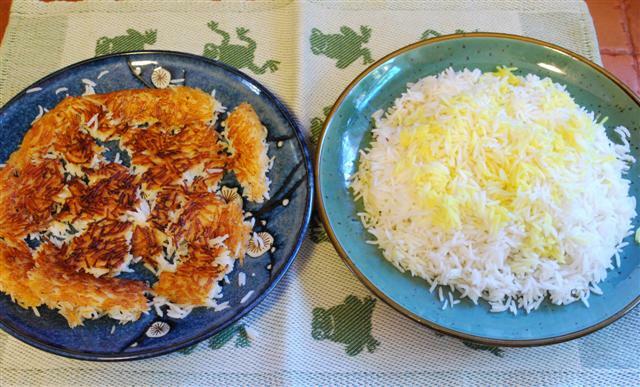 There are two ways to serve Persian rice. Here is the first way (my favorite way): Place your serving dish on top of the pot. Flip the pot while holding the dish against it firmly. Remove the pot and voila’! Look at the fabulous color of that Tahdig. Yummy! 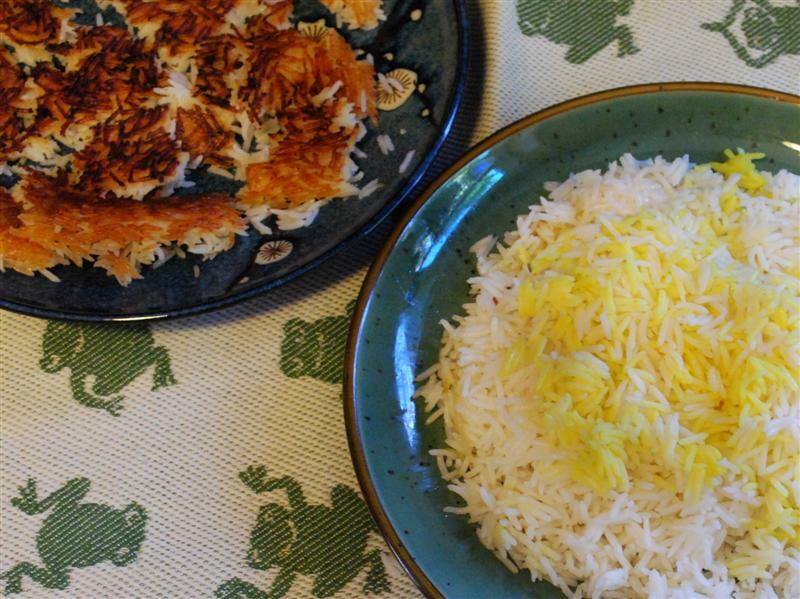 The second way of serving Persian rice is by plating the rice in a platter, then remove the tahdig and cut it in small pieces and placing it in dish. Usually when people plate the rice this way they will place some rice mixed with saffron on top for decoration purposes. This is really simple to do. Here is how you would do it. Instead of adding all of the saffron water to the yogurt, reserve about 1 tsp of it. Add a couple of spoons of rice and mix well. Place the mixture on top of the rest of the rice. Then proceed with the cooking process. Once your rice is ready, remove the rice with saffron from the top of the pot and place in a bowl. Plate the rest of the rice and then place the saffron rice on top. I have been looking for a good rice and a good kebab and i found both on your blog! I can’t wait to try them both tomorrow night. I will definetly be adding your site to favorites! I love persian food. Do you have any recipes for the bread (kinda like nan?) i used to get it with the raw onion and butter at an old restraunt that is now out of business, and I dont even know what it is called! thanks, your blog is great! Callie, I am glad I can be of help. I have not ventured into bread making yet….one of these days I will though! Ellen, any type of yogurt will work out. I have asked my mom several times to teach me how to make good pollo with tadig while I’m away at college. She didn’t want me to “waste” my time making pollo every night. HA mom! Now what? I’m gonna make pollo with tadig everyday. Thanks My Persian Kitchen! Tonight I set off the fire alarm after burning the rice during the 10 minutes on high – any suggestions about how to tell if you should turn the heat down before 10 minutes?! Dee, oh boy! I suspect that you may have not had enough oil and water at the bottom of your pot and that’s why things got smokey! My longing was not for her love. But for her persian rice. And I am making it as I post this. i followed this and under just burnt and i ruined my pan!!!! which was very expensive???!!!! any suggestions with oil as i did use rapeseed as i always use that now instead of olive- should i of used veg oil? Laura, I am sorry your rice burned. Grapeseed oil is a good option as it can tolerate high temps. There are a couple of things that may have gone wrong here. First thing is that maybe you didn’t have enough oil at the bottom of the pot. The second issue might be that the flame was too high. Make sure you set it on the lowest setting possible. I just tried this. With India Gate basmati, after a three hour soak, it was already getting too soft after a six minute boil. For the tadig I put the pot on 5 (dead medium, electric stove) for ten minutes, and it was starting to smoke before the time elapsed. I don’t think I started with enough oil and water at the bottom. Sometimes due to the Leidenfrost effect, higher temperatures scorch less. I’ll have to experiment. People trying this need to realize you have experiment with the parameters a few times to get it right. A perfect crust is a gold star. You don’t get one on your first attempt. Is it ok to use some fresh lime instead of the dried limes called for in Ghormah Sabzi recipe? Lesley, sure in the absence of dried limes, you can use the juice of fresh lime at the last few minutes of the cooking process. I made Persian rice tonight, and the rice came out great but my tahdig is all soft and barely held together. I’m so sad that I don’t get any tahdig this time. Did I take the rice out of the pot too early maybe? This is my second time making persian rice and the first time the tahdig I got was great. Third time will be the charm I think! Thank you for the recipe. Kayvan, it takes patience and practice! You probably didn’t cook the rice long enough or there was too much liquid at the bottom of your pot. As an American I lived in Iran in 1975 and was a sous chef in an Iranian restaurant in 1986 in L.A., so we cooked ‘the rice’ several times a day. Usually we used lavash for the tahdig and no extra water or yogurt, just oil, with only a few minutes on high to get things going. Then it was down to low, not medium/low for at LEAST a hour plus. This technique takes and needs time and patience to not burn it and get a good steam and decent crust. Thanks for the advice, I have tried many times to make Persian rice but always seem to end up with okay-tasting rice but no elusive tahdig!! I will try this method next time, thanks!! THANK YOU!!! I have been begging my mom for years to just write this down for me. And she replies “just watch me do it”. I can’t begin to tell you how many times I’ve watched her do it and still can’t get it right. I can’t believe I just found your blog. Can’t wait to satisfy my craving of ghormeh sabzi on tahdig. First off, I am in LOVE with your website. I have been begging my mom to show me how to cook. She says just watch me, add a little of this and if it tastes like this, you want to add that. it never worked out. I have tried a few of your recipes and they all came out just right, even got the seal of approval from my mom. I still haven’t perfected tahdig yet. I was wondering what size pot you are using? I can’t seem to have enough yogurt and rice to cover the bottom. Also should the rice have a bite to it when we drain it. I’ve been experimenting with the time. 10 mins on my stove gives me mushy rice. Especially for some of the polow recipes. Thank you again for a detailed and update blog. Love all the pictures and I look forward to some serious cooking in the next few weeks. Mandana, glad to hear that you have been having success in your cooking. When you parboil rice it should be al dente. This means that it should be just tender to eat but not cooked all the way through. It doesn’t really matter what size pot you use, what matters is that you have enough canola oil at the bottom and just a bit of water enough to cover the bottom of the pot. How can I use this recipe and make lavash tahdig?! How can I use my Persian rice maker and have as good tahdig like the traditional tahdig with the yogurt? Goli, you can, however, you’d have to remove the rice from the rice cooker once all the water has been absorbed. Then mix rice, yogurt and oil together and add a little water to the bottom of the pot. Then pile the rice on top. I love your website! I’ve been looking to start making Persian food ever since my former mother-in-law first introduced me to it, but didn’t know where to start, so I’m so happy I found this website! I love tahdig, and she always made it with a non-stick pot, but I don’t own any non-stick cookware. I have stainless steel and cast iron. Could I make it in either of those, or should I buy a non-stick pot? If I can make it properly, I see myself making it pretty often. Rachel, your best bet is a non-stick pot. Im going to try to make the tadig , is there a recipe without the yogurt? Assal, you can make this recipe by simply omitting the yogurt. Simply line the bottom of the pot with canola oil and water, then add rice. Ting, you can either use the standard or the rice cooker cup, regardless of which you use, make sure that you use the same one to measure the rice and water. The water that the rice was soaked in should be discarded. To all of you Iranians who have mothers who show you — I hear ya! I have the same experience with my mom, God Bless Her! I think what she’s trying to show me is that it’s easy if you follow the steps … and she’s even trying to get used to my stove and cookware. We end up with no tahdig, too much burnt tahdig…but the rice is always delicious! I absolutely adore your sense of humor! And of course the advice on tadtig. I think I know the Mondana and her Mom, and understand her problem. This is probably a carnal sin to ask this, but my mom will not even venture here … Do you ever try this with brown rice? I love Persian food but was trying to stay away from the white stuff. My guess is just cooking time and water might be more/longer. Have you ever tried it? It turns out ok in the rice cooker. Just ok though. Anita, I have been meaning to try basmati brown rice…you can definitely try it. I would add a bit more water than usual. I made this using a stainless steel (ie. non-stick) pot because unfortunately I don’t have a non-stick pot as you advised. The yoghurt-rice mixture burnt and stuck to the pot, and the rice above it didn’t have a nice texture. In my experience many (most?) Persians don’t know how to cook rice well. But I’ve had rice in a Persian restaurant and it was wonderful. I just wish I knew how they do it. Tim, the best type of pot to use is a non-stick kind and also make sure that the rice is steamed on the lowest setting possible to prevent burning. Ghazaleh, what type of rice did you use? If your rice came out mushy then it probably was over cooked in the first part, the par-boiling part. The initial amount of water doesn’t really make a difference. What makes a difference is making sure that the rice is al dente in the first par-boil part and that there is no moisture going into the rice as it steams. I hope this helps. I am so excited to have found this website and a market that sells dried limes. My life is complete now that I have all the stuff to make gheimeh and Persian rice. I just have one question…have you tried using brown basmati yet? We only use brown rices, so I am really hoping to get your expert input before I try making the rice. Hi, I love Persian food, and thankyou for you lovely recipes ! I just wanted to ask if you would be able to show how to cook the basic steamed rice , but without the tahdig, I would be very grateful as I’m useless when it comes to cooking rice. Thank you so much for this! All of your recipes are so funny and insightful (and delicious)! I appreciate them so much. Sarah, excellent question. I have never done that before, but you certainly can experiment and see what happens. Let me know the results of your experiment!! !